Beautiful historic property, originally early 1800’s tavern with rich history as a working farm, seasonal vacation home, inn and year round residence. Property sits at the base of Mt. Monadnock with beautiful mountain and pastoral views. One of several buildings on the estate, the huge 6 bedroom, 8 bath brick home was built with talent and craftsmanship from a bygone era. Tastefully furnished, this home is full of elegant period details and country charm. In addition to 5 second floor bedroom suites and 1 third floor bedroom suite, the home has a large, lovely eat in country kitchen, formal dining room with chandelier, cozy den, peaceful library and huge formal living room on main floor. Large furnished screened porch off living room. Basement has additional bathroom and game room with fireplace, pool and foosball tables. Beautiful outdoor space; stone terrace off kitchen. The brick house stays comfortably cool through the summer months. This gem is a true vacation retreat. No telephone or TV; cell reception good and internet access included. Step back and enjoy a relaxing stay at this one in a million country home. Offered as a private, fully functional home; flexibility in level of services available to meet your needs. Your party will be the only guests in residence during your stay. Each of the six bedroom suites has a king size bed and its own private bathroom. In addition to the fully functioning home, the property also offers a charming, banquet facility. Originally a working barn, open beams, wood floors and massive chandeliers create an elegant, rustic atmosphere. The hall is capable of accommodating up to 130 guests for weddings and special events. Larger events welcome, should lessee provide outside tenting. Large, pastoral green space with a mountain view adjoin the banquet hall. The kitchen available for staging and serving, no on site food preparation is available. All outside vendors are welcome to service your event. Round banquet tables and reception chairs are included in venue rental, as well as china, glassware and flatware. 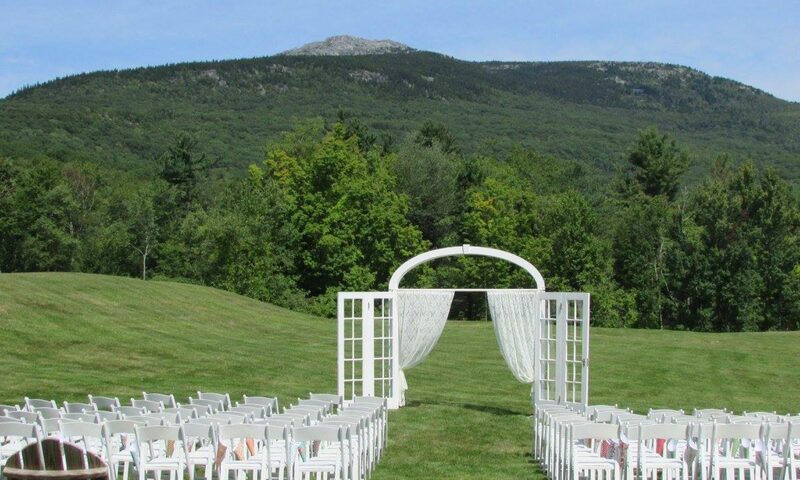 Outdoor ceremony chairs are also included. The entire property is open seasonally May through October. Contact us for availability and pricing. Activities on the property include: hiking the 333 estate acres, walking or biking the estate’s internal road network, birdwatching / observation of extensive wildlife, climb Mt. Monadnock or just relax and enjoy the breeze and gaze at the mountain in your own backyard. Unlimited scenic opportunities for artists and photographers. Shattuck Golf Course is less than a 5 minute drive; 3 lakes with public access/ beaches in town, all less than a 15 minute drive! In town there’s a Subway & McDonald’s, 2 local pizza/ sub shops, a pub/ burger sports bar, a Chinese restaurant as well as a few finer dining establishments. Grocery store is 15 minutes away. Dollar General and Family Dollar stores in town. Property conveniently located on Route 124, in small, quiet, southwestern NH town of Jaffrey (population 5,000). To learn more about the area, look up the Jaffrey Chamber of Commerce online for Visitor Info. Fifteen minutes to Keene or Peterborough, NH. For a tour or more information, contact Pamela Royce, Property & Business Manager @ 603-325-8883.